Ionic Iron from Trace Minerals is a vegetarian formula that contains no animal products. 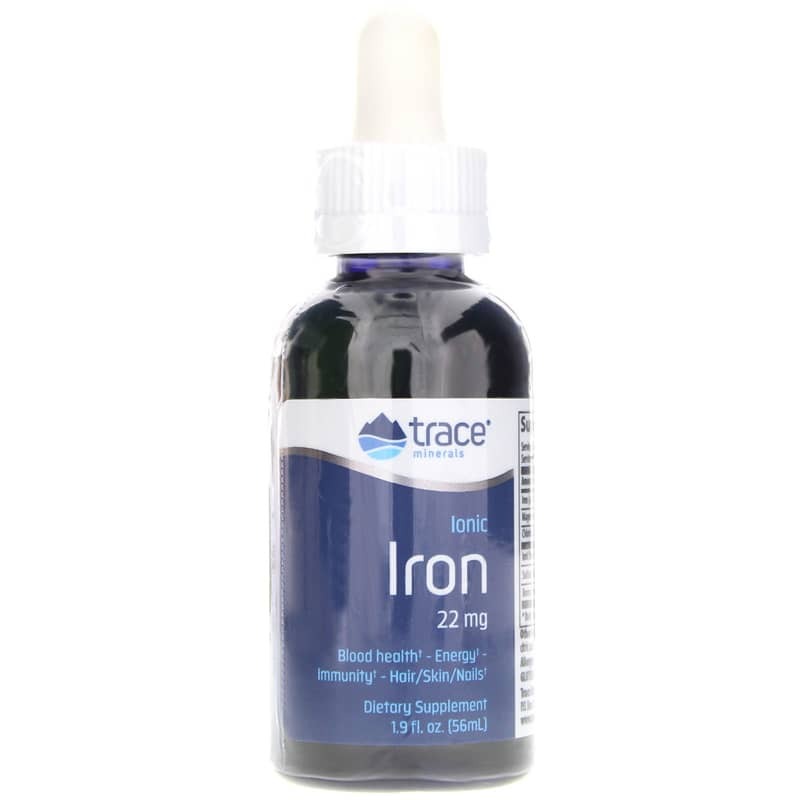 Ionic Iron also contains a full spectrum of 72 naturally occurring minerals and trace minerals from ConcenTrace. Iron is an essential mineral for optimal health. 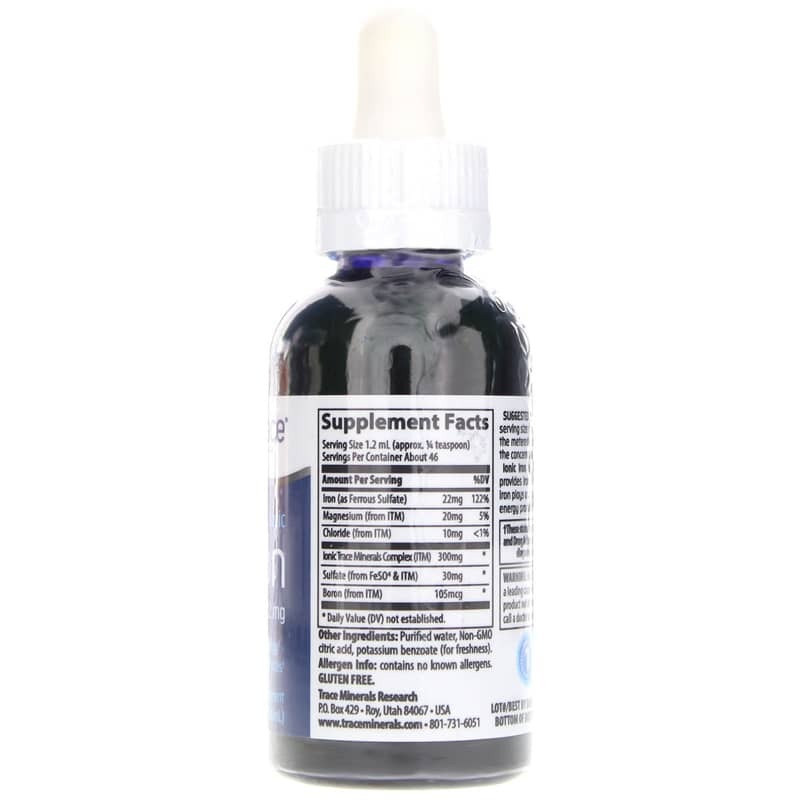 Research indicates that it plays an important role in proper enzyme and cognitive function, energy production and optimal immune system. Other Ingredients: Purified Water, ConcenTrace, Citric Acid, and less than 0.1% Potassium Benzoate. Contains NO: Gluten, GMOs. Contains no known allergens. Vegan. Adults: Shake well before use. Trace Minerals recommends spreading the serving size throughout the day and taking it on a full stomach. 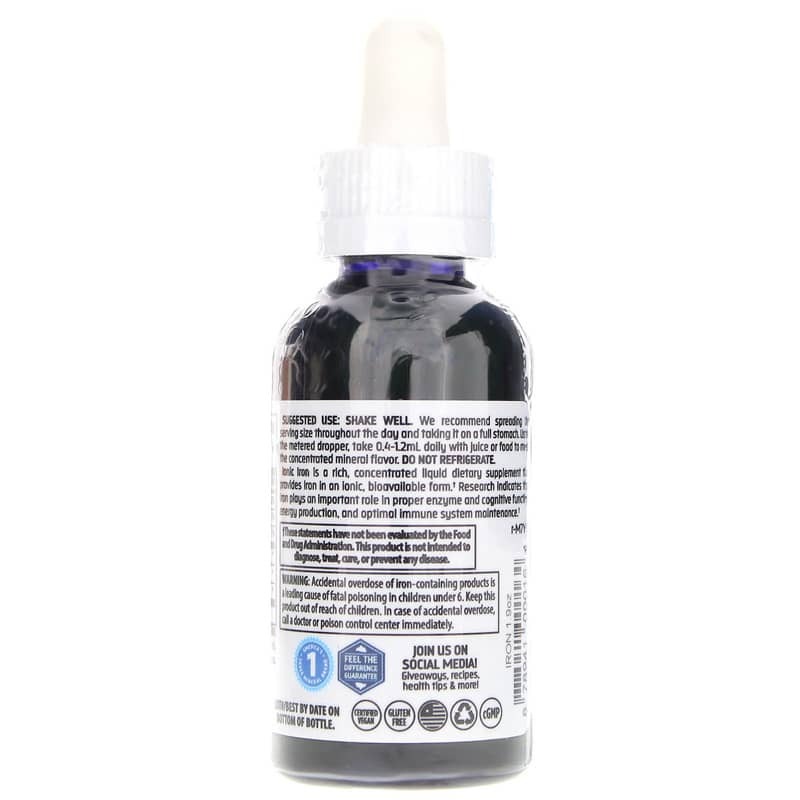 Using the metered dropper, take 0.4-1.2ml daily with juice to mask the concentrated mineral flavor. Refrigeration not necessary. Accidental overdose of iron containing products is a leading cause of fatal poisoning in children under 6. Keep this product out of the reach of children. In case of accidental overdose, call a doctor or poison control center immediately. If you are pregnant, nursing, taking medications or have a medical condition, please consult your healthcare practitioner before taking any dietary supplement. Keep out of the reach of children. I buy this for my teenage daughter, a distance runner. I like the fact that it contains ferrous sulfate to support her ferritin levels. It's also convenient that it is in liquid form, as she has trouble swallowing pills. Love that it's non-GMO! I have iron deficiency anemia and am always forgetting to take my pills. I take the pills with water/liquid but I still though this would help me better as it is more concentrated and would go down easier since it is liquid (I take 2 or 3 iron pills a day depending on the mg to get the dosage I need). I chose to mix it with cola; still a very strong iron taste but I found it tolerable enough. <br><br>What I didn't find tolerable were the constant pressure headaches this brought on. I followed the bottle's recommendation of splitting up your dosage into smaller ones throughout the day but it didn't help. I thought maybe I just had to 'get used' to this new way of taking my iron but after about 2 weeks I couldn't stand the headaches anymore and stopped taking it. Back to regular pills. <br><br>Interestingly, I had the same bad reaction when I took St. John's Wort pills , when I can handle the tea (Yogi Branded rated here also) just fine. I think then I just don't well with concentrated things. But still, I'm giving one star as it doesn't say anywhere (that I recall, I no longer have the product) that this side effect can happen (didn't say not to mix with caffeine either if I recall, so IDK if that could have been the issue). Also, it made me feel worse, not energized at all. I'm not very good at taking iron pills-or any pill for that matter. I typically am good for a while but then start forgetting to take them. Furthermore it's often difficult to find 65 mg of Iron; most of the time I have to get the 22mg and take 3. That's along with a fairly large multivitamin, which ends up being a bit hard on my stomach (and gag reflex). So I was hoping with this liquid iron that even though I'd have to take 14 drops to get my proper dosage (my pill bottle says the liquid equivalent on it) it would still be easier since I could mix it with a beverage.<br><br> Per instructions I broke up the dosage to several through the day (I believe I started with 2 or 3). Unfortunately the first day I took the first dose I ended up with a pressure headache and fogginess akin to being on prescription pain killers. I don't do well on those either, so I was in bed sleeping it off the rest of the day.I thought maybe my body just needed to get used to taking iron in liquid form, so I continued to take it for 2 weeks, furthering breaking up the dose. I got the same reaction every time so I finally quit since I wasn't able to function. <br><br> I had a similar reaction to St. John's Wort pills (when I take tea containing it just fine) so I believe I may be sensitive to concentrated things. I also wonder if I should not have mixed the iron drops with caffeine, though there was noting on the label that warned against it. Therefor all I can do is speculate, and give this 1 star for not listing potential side effects. I have a hard time believing I am so unique that no one else has experienced them. It really should be on the label. I was hoping this form of iron would make it easier for me to remember to take every day since I could mix it in a beverage, however it just gave me terrible headaches. I tried to give my body a chance to 'adjust' to the liquid form, however after a week or so (this was some time ago so I'm not exactly sure) I finally discontinued use. I went back to regular tablets and have had no further ill affects. These may work for some but perhaps others like me are just sensitive to liquid or certain formulas of things (I've had issues with St John's Wort as well which I reviewed). So if you have had similar issues with things in the past you may want to pass these up.